Hello my name is Jason McKinney, I'm a 23 year old power lifter from Kentucky. I just recently competed at "The Beast Of The Bluegrass" where I placed first in my weight class and division. To date my competition lifts are a 507lb squat, a 363lb bench, and 532lb deadlift. I had an old username on the old school Terminal Vertical forum (bball08). For those who have a YouTube channel subscribe and follow my progress as I plan to compete in the 242's this September. 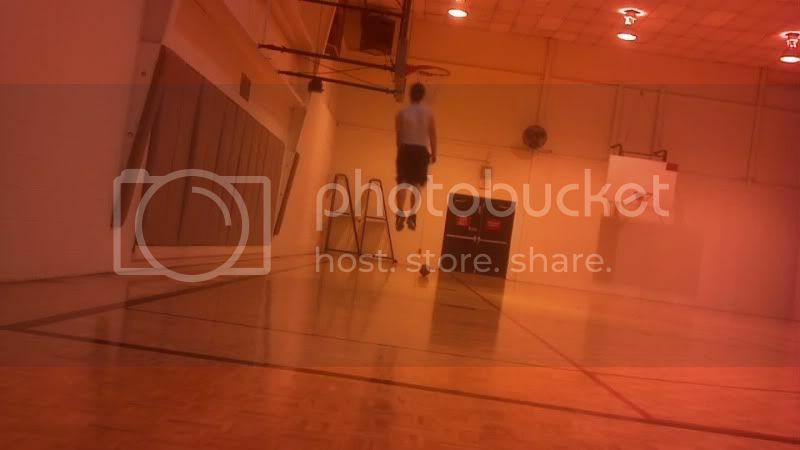 I'll also try to get some jumping/dunking footage up as well. Thank you all! Do you have any idea what your standing vertical is? It would be pretty badass to see a big guy like you dunk and shed off that "powerlifters" aren't athletic trend. I haven't gotten an accurate measurement on my vertical in about 4 years, at that time I was around 32" off a standstill and 36" off a run and go (unilateral take-off). At 6'1" and 230lbs I was able to dunk pretty decently, I actually have a pretty decent success story to share with you all. In a nutshell 16 months ago I had ballooned up to 348lbs and was becoming unhealthy. That was mainly due to old eating habits coming back and doing zero cardio with my training, I knew I was committing to Beast Of The Bluegrass so I set two major goals, one being losing enough weight to compete in the 275's and the second total over 1,400 in my first meet. Very happy so say I nailed both of those goals as I weighed in at 266.4lbs and totaled 1,402lbs. Best part of the story is I'm much stronger at a sub 275lb BW than I was at 348lbs (in my mock meets that took place in my home gym I was only totaling 1,200ish at a SHW BW). Even though I train as a power lifter, I think outside the fat guy in a multi-ply lifting suit lol! I try to follow the example set by Stan Efferding, Dan Green, along with a few other guys that it is possible to be lean and nail some major totals. Raw powerlifting is making a huge comeback now thankfully! And I'm a big believer in strength being purely functional for many other things outside just being good at 3 lifts. I love doing crossfit or some type of HIIT training post lifting to get myself into better shape and to date it hasn't effected my stats in the gym one bit, it actually makes my recovery time in between sets much quicker and is functional for other things too. I plan on keeping a log over here, and hopefully I can get a measurement on my vertical within the next few days. As of now I can grab rim off a standstill (3-4" over) and running I can get my wrist at the rim from time to time. Welcome!!! Beast lifts! Looking forward to seeing some dunk vids and following your log! A 275lbs competitive powerlifter with the jumping virus too?!?!? Awesome!!! Thanks man!!! and I'm absolutely here to stay, and this time I plan on being a more functional member than I was on the old forums that are now closed. I come from a basketball background as I played from little league up into highschool, two obsessions grew from that one being weightlifting and the other being jumping/dunking. even though in the basketball off-season I trained my jumping using programs from the VJB I wasn't able to flush a good dunk until a year after graduating highschool, I could "get up" good for a 286lber (weight I was up to when I graduated HS) but as I entered college in my local community I decided to use Ketogenic dieting principles that eventually got my bodyweight down to 230-235 in about 10 months. that's when my jumping really spiked! at one point off a unilateral takeoff I could touch half way up the white square (approx. 10'11"). and at that time if I had the home gym setup that I currently have I believe I could have achieved a higher level, because at the time I didn't have access to a proper place to squat or train my lower body properly outside just doing BW plyometric stuff. Eventually I got married and had a son that will be 3 next month, even though I continued to lift/powerlift after settling down my diet and cardio slowly became non-existent. and that's when I went from 235 up to 348 in about 2 and a half years. today I'm glad to say my nutrition is much healthier, cardio is consistent in my training routine, and I clawed my way from being a SHW in powerlifting to a sub 275lb weight class and I'm hoping to make the 242's in September!